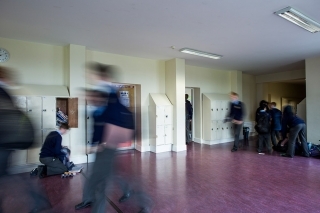 Classes in the junior cycle have a Class Tutor who takes a special interest in the welfare of those students. The tutor works with the class to build a happy, harmonious, hard-working atmosphere in which each student is allowed to be himself. Tutors are usually assigned to a class which they teach on a daily basis and so therefore have regular contact. Class Tutors work with the Year Head to ensure that the atmosphere in the year group is the way it should be, ie the staff aim to see tolerance, openness, friendliness, respect and co-operation throughout the college. The College management doesn’t like cliques and bullying is abhorred. If it is detected that there is even the smallest act of bullying, the Class Tutor, the Year Heads, the Deputy and the Headmaster will move quickly to inform the bully that his behaviour has no place in the college and to support the victim and let him know that everyone is on his side.